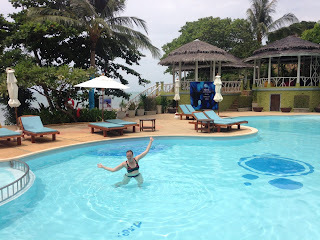 We arrived on Koh Samui with a hotel booking for 5 nights (at the strong urging of some great fellow world travelers we met on Koh Tao (thanks Michelle and Martin!) and very quickly fell in love and extended our stay to two weeks. And really, the only reason we're leaving after two weeks is that our visa will run out and we aren't particularly keen on sightseeing on the inside of a Thai prison. 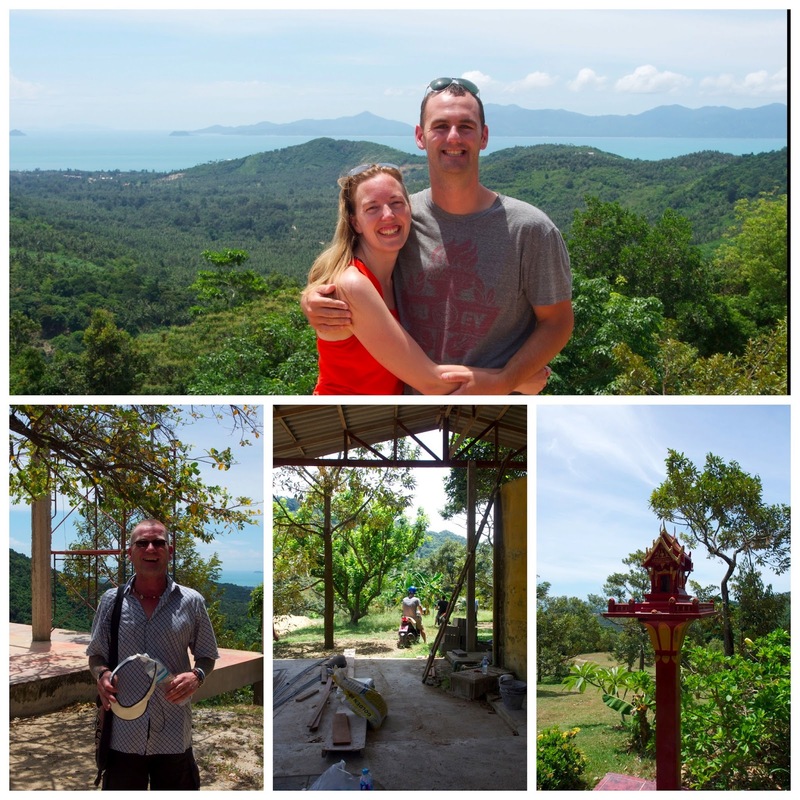 We hopped on the ferry to Koh Samui and had an adventure right off the bat! The last passenger to board was a local guy on a stretcher, with a nurse holding his IV bag. They brought him onto the ferry (presumably to go to the better hospital on Koh Samui) and put his stretcher on the floor at the front of the main cabin, just up against all the luggage. And when the ferry docked, do you think the passengers thought, gosh, I think I'll let the dying man go first? No! Everybody rushed the front to get their luggage and be the first to disembark in paradise!! Cory and I held back, and by the time we got to the luggage, discovered the blood all over the floor from stretcher guy. Yummy! 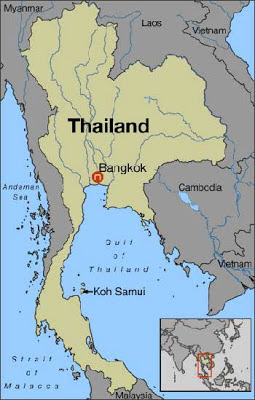 Koh Samui is a much larger island than Koh Tao (it's the second largest island in Thailand, after Phuket) and has lots to see and do all over. 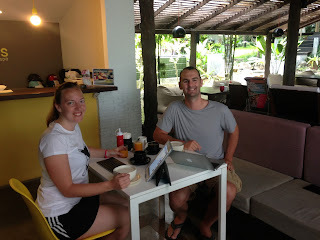 At Michelle's suggestion, we booked ourselves at Sunday's Sanctuary, a resort set in the jungle at the north end of the island, in the area of Bophut. We arrived and fell in love! The sanctuary is at the top of a local road above a beautiful temple, with raised wooden walkways carrying you over the foliage to different outcroppings of thatched roof rooms and a mountain building in back where we stayed. The staff are friendly, the pool is a delight after a long day of sightseeing, and the muesli breakfast is a delicious start to the day! Sure, there are some (read: lots of!!) bugs, there's no internet in the rooms, the TV is older than I am (and has no remote! ), and it gets unbearably hot when the power goes out on the island (every few days or so). 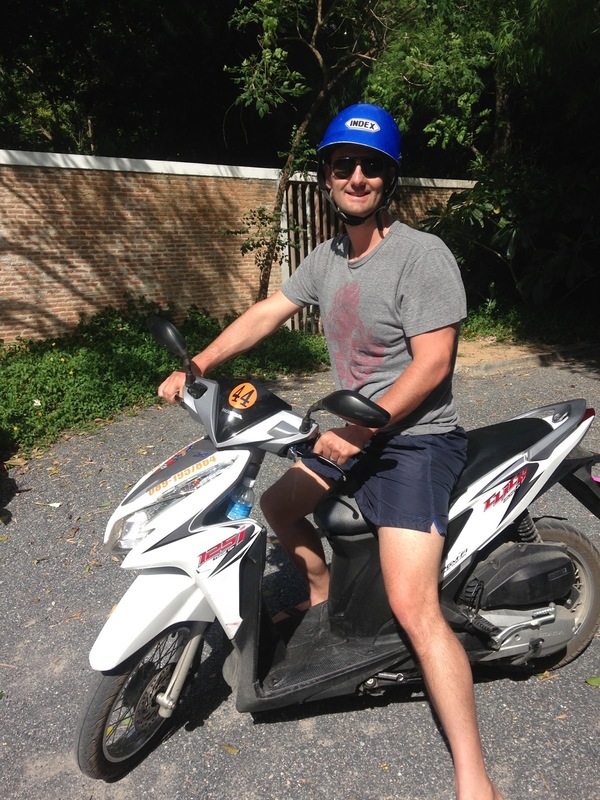 But at $20 US per night, with a scooter rental of $6.75 US per day, a sanctuary it is!! 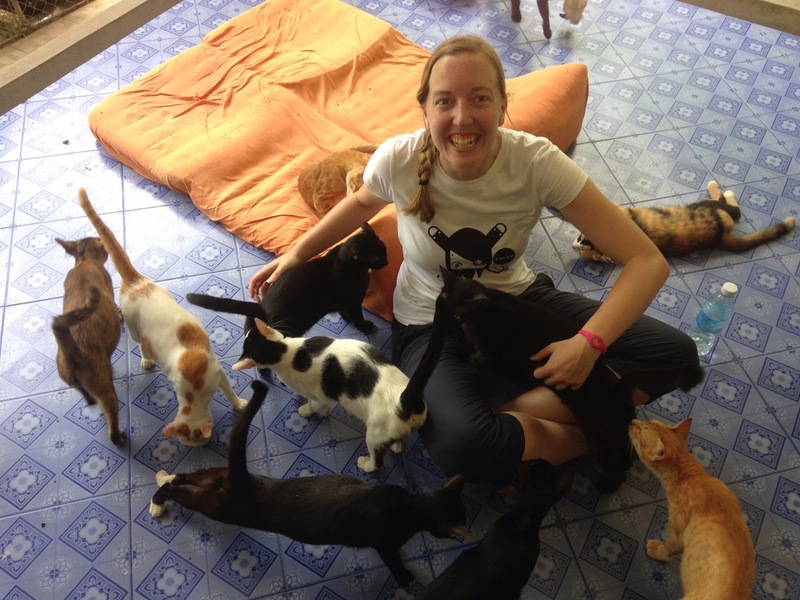 Samui Dog and Cat Rescue: After so many days of self-indulgence we thought it might be nice to volunteer to help the island, and came across a great opportunity, at the Samui Dog and Cat Rescue. The shelter takes in cats and dogs from all over the island (and there are A LOT of them! ), spays, neuters and takes care of any other medical needs, keeps them for observation as long as needed and then returns them to their island home. Or keeps them at the shelter forever after if their prior home is not a good option. They welcome volunteers and visitors wholeheartedly, even to just pet the animals. So pet them we did!! We got to the shelter, let ourselves in and found the cat house, an open sheltered room with about 40 cats, all looking for some love. We plunked down on the floor of the house and got swarmed with love!! We had a nice hour of petting and playing before it was time to head out, and I think it's safe to say that we enjoyed it just as much (more maybe more) as the kitties did!! As the shelter does all of their work at no cost, they are always looking for donations to help them help the animals of the island. 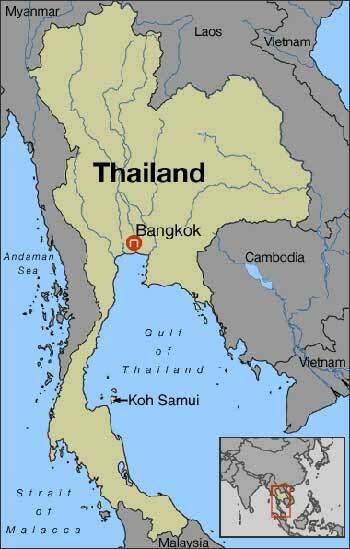 If you'd like to contribute to this great shelter, you can do so at http://www.samuidog.org. Inland Adventures: We took our scooter to the interior of the island, all lush jungle and water buffalo grazing under the palm trees. There are some impressively nice, smooth concrete roads winding through the jungle, though we passed some less fortunate tourists on our trip up an incredibly steep hill. One guy was going down the hill too slow and his bike toppled over (he was ok) and another couple had a bike that couldn't make it up the hill, so she rode to the top while he walked straight up in the hill in 92+ degree heat. Ouch! As we continued on through the forest (following a terribly unspecific tourist map), we came to a junction and we trying to figure out which way to go. And then three other scooters pulled up and we asked the way. One of them, Max, was an exuberant Brit who knew the area and said, "if you see a road and you want to know where it goes, take it!!" so we followed them down the road to what was supposed to be a beautiful vista. Thank goodness we were following them, because that road soon turned into a dirt track, partly washed out from this season's rains. Then it clearly became a 4x4 track. Then it stopped altogether at the edge of a local man's outbuilding. We parked the bikes to walk to the end but the local man waved us through…his building. So we drove through, and down a grass meadow to find the road picked up again. We kept following Max and ended up at a stunning vista overlooking the entire north side of the island. And despite all the challenge to get there, and the fact that we certainly would have given up if we weren't following someone else, there was another local guy with a cooler of drinks to sell anyone who might make it all the way there! O2 Beach Club: We went out for a drive on our trusty scooter around the east side of the island to explore, and happened to turn off the main ring road onto a street that looked promising. We drove for a bit through jungly trees, following a sign that said "free beach access." That access turned out to be the O2 Beach Club. I had seen an ad for this place in a magazine here, and it looked like spring-break-woo-hoo, thumping music, drunk coeds and overpriced drinks (so not our scene per se). It turned out to be a lovely sparkling pool surrounded by loungers next to a secluded bay with a sandy beach and more loungers. And there was not a soul in sight (the odd beauty of arriving during the hot season I suppose). I asked a bartender who was napping in the shade about the cost of the club, and he said it was all free. Seriously?!!? So we hunkered down (Cory was a little suspicious of "free" but loosened up when our favorite new bartender opened up a beach umbrella and laid out fluffy towels for us, all with that typical Thai smile), ordered up a couple of fresh coconuts and went for a dip in the ocean (followed by reading in the loungers, a dip in the pool, more lounging, you get the idea!). And sure, the coconuts were more expensive than other places, and we tipped him well as we would likely be his only customers that day, but it was a steal of an experience for the $9 we ended up paying in total. Can't wait to keep reading!! !